KEF's R Series speakers deliver the kind of effortless detail and dynamics that have made the British speaker company famous in audio circles worldwide. The R500 features a three-way design with two 5-1/4" woofers providing authoritative bass down to 46 Hz. Each elegant cabinet is finished in beautiful gloss black and includes stabilizing outrigger feet with carpet spikes and protective discs for hardwood or tile floors. The two 5-1/4" aluminum woofers are designed flatter than most woofer cones. That makes them stand out visually, but more importantly, they produce accurate and dynamic bass. Massive magnet structures and large aluminum voice coils help these woofers remain tight and musical at all volume levels. 3-Way Floorstanding Speaker: Featuring an all-new Uni-Q driver array and two 5.25" low-frequency bass drivers, the 3-way KEF R500 floorstanding loudspeaker delivers clarity and realism with flawless precision and superb dynamics. Its stylishly, uncluttered appearance beautifully complements its startling clear highs, fast and clean midrange response, and accurate low-end frequencies. All New Uni-Q Driver Array: The R500 floorstanding loudspeaker features KEF's all new Uni-Q driver array with a 1" aluminum dome tweeter mounted in the acoustic center of a 5" magnesium/aluminum midrange driver. With both the tweeter and midrange driver operating as a single-point-source, you'll hear detailed, accurate three-dimensional sound, which is dispersed more evenly throughout your room. 5" Magnesium/Aluminum Midrange Driver: Surrounding the 1" aluminum dome tweeter is a 5" magnesium/aluminum midrange driver. The R500's midrange response is amazingly fast and clean, thanks to the braced magnesium/aluminum alloy cone, KEF's Z-flex surround smoothing the transition to the front-panel, and a sturdy die-cast aluminum chassis that prevents resonance from being transferred to the cabinet. In addition, large voice coils increase the driver's power handling and dynamics, reducing distortion and delivering exceptional vocal clarity. Dual 5.25" Bass Drivers: In addition to the a Uni-Q driver array, the R500 floorstanding loudspeaker also features two all-new 5.25" bass drivers for lower frequencies. The combination of a massive vented magnet assembly and a large, lightweight aluminum voice coil driving a light, stiff and strong aluminum cone assures clean, deep and uncompressed bass output with superb dynamics and power handling, plus fast and clean midrange response. 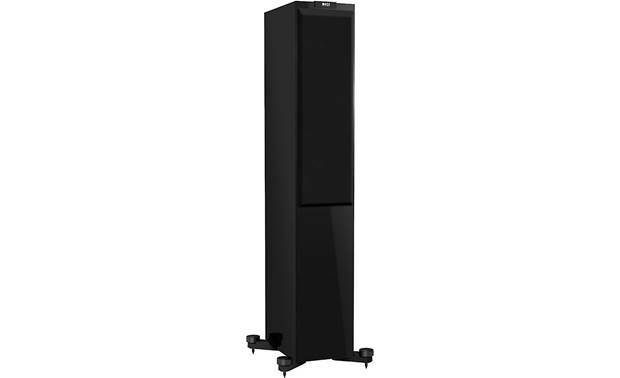 Computer Designed Crossover: The KEF R500 floorstanding loudspeaker utilizes computer-designed crossovers (500Hz, 2.8kHz) that allow the level of each driver to be fine-tuned for a smoother, flatter response. Computational Fluid Dynamics (CFD) Port Design: Featuring a Computational Fluid Dynamics (CFD) port design, the geometry of the bass reflex ports have been tuned to minimize turbulence at high levels, reducing noise and low frequency compression. Two ports are located on the rear of the speaker cabinet. Placement Options: A pair of R500 floorstanding speakers should be positioned 6' to 10' apart. They should be positioned at least 9" from the back wall due to their rear-firing port and 39" from side walls. 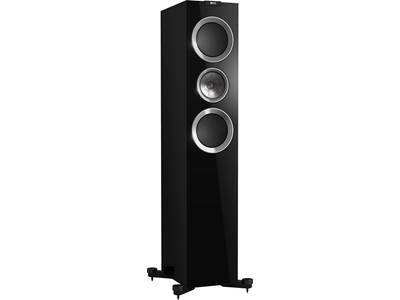 The speakers can be "toed-in" or angled inward toward the main listening area to improve stereo imaging and soundstage.